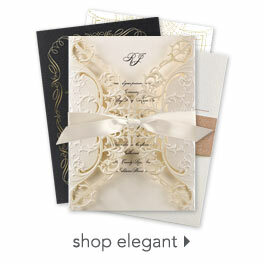 You'll love the style of this 3 for 1 wedding invitation - AND you'll love the affordable price! The heart and filigree design and your wording are printed in your choice of ink color and lettering styles. The 3 for 1 wedding invitation includes three pieces - a wedding invitation, response card and reception card - all for one low price. Due to the unique printing process required to offer you this invitation ensemble at a lower cost, all three pieces come on one sheet and are perforated for easy separation. This product features thermography printing. Thermography is a unique printing technique that results in raised lettering you can feel, which adds to the luxurious experience of this printed piece. Includes inner and outer invitation envelopes and response card envelopes. We were looking for something simple and these were perfect! We've gotten so many compliments on how they look. Shipping was super fast! I love that you could see the product & changes before ordering! I am obssesed with hearts & sparkle/glitter so I got the shimmer paper. When it came I was in awe, it looked better than I could ever imagine. I liked these invitations, because I like that reception & response cards came with this invitation, rather then an additional cost. The only con The "inner" envelope was the same size as the outer envelope, so I did away with the inner envelope. I love my invitations. The ordering process was super easy and they arrived in no time. The only thing I am a little disappointment in I did notice some leftover edges on some of the invitations as we separated them and some of my envelopes were wrinkled up but luckily we had extras. Overall I am pleased with my invitations. I loved these invitations! They were afforadable and made things easier. Instead of having to order multiple different things they all came in one! I even got them sooner than expected!! I only wish they had more to choose from. So happy with the quality of the invitations i received! I purchased several samples from different sites and these were the greatest quality for an unbeatable price! Also loved how the color coordinates great with my wedding colors! I bought the invitations for my upcoming wedding! I got them in a dark blue color and love it! My only complaint is that one of the invitations had a brown spot on it... So I have one less that is useable. Other than that they turned out well and I'm looking forward to sending them out to my guest! Got the invitations in the mail a couple weeks ago. They are easy to rip apart, and they look exactly like they do online. I loved the added bonus of our address on the return envelope for free. My reception is at the same place as my ceremony so therefore i turned the reception card into a song request card! Turned out perfect! Won't be sending these out for a few months but can't wait! Very fast shipping as well. I bought this product for my destination weeding. The invatations were just what I needed! They were the perfect size to fit inside the pockets I ordered from a different company. I just used a paper cutter to trim the perforated edges off them to make them look fancier. The invitations came faster than expected and they looked great. The website is easy to follow and allows you to create the perfect invatation for you! I ordered a few samples of invitations and my daughter fell in love with this one. Don't let the "perforated edges" fool you. We were able to seperate each of the pieces in this 3-in-1 invitation and it came apart crisp and clean. (It didn't look sloppy at all). The detail is gorgeous (her wedding is heart themed) and the color matched perfectly. All items were printed correctly and when it arrived, it came in one box, but yet there were other boxes inside. One for the invites, one for the RSVP envelopes, etc. This invitation set was a great value and we are so pleased with our purchase!My daughter and I couldn't be happier with the quality of this product. Can't wait to start putting them together and sending them out! The product was used for Wedding Invitations. I Loved how I got all 3 cards that I needed and I didn't have to pay any extra and they were very easy to tear apart. I just wish that there were more to choose from and there were more details in it. My Delivery was on time and in great condition. The color matched my color theme perfectly and the invitations look beautiful. Delivery was fast and ordering the product couldn't have been easier. Was planning my wedding within months and came across Invitations by Dawn. So very thrilled with what I saw and so many different things to choose from. Did not have to drive from store to store trying to find what I needed and did not have to pay extra printing charges or for different colors. I tell everyone about this website. Keep up the good work.